The new LCMS-8045, Liquid Chromatograph-Mass Spectrometer is an optimum balance of sensitivity, speed and robustness. The system features a heated ESI probe, high-temperature heating block, heated desolvation line, drying gas and focusing optics all acting to maximise sensitivity and achieve superior performance. Equipped with a heated ESI probe, the LCMS-8045 has the highest sensitivity in its class. The instrument is capable of record-breaking speeds such as world’s fastest scan speed (30,000u/sec) and its positive-negative ionization switching speed is also the world’s fastest (5 msec). High-speed acquisition benefits the laboratory by reducing run times for increased throughput and with the Nexera UHPLC as the Front LC, it accelerates the analysis and achieves a greater reduction in the time required. 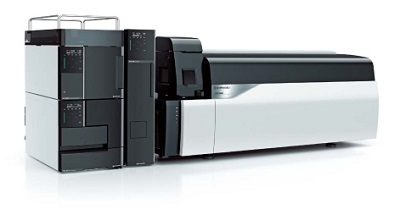 The LCMS-8045 has been designed to be robust. Desolvation is facilitated and contamination from droplets is prevented due to the synergies between the heated ESI in the ionization unit, the high-temperature heating block, the heated DL and the drying gas. Highly reliable data even for the long, continuous analysis of samples such as complex biological and food samples that include many contaminants, are provided by the system. 12,000 plasma samples were injected over 25 days (over 480 samples per day). Picogram levels of alprazolam were analyzed with an RSD of 3.42%.